SuperSTEEL is a plug-in design module for the design of steelwork to BS5950. The structure is modelled using SuperSTRESS; once analysed you can seamlessly enter SuperSTEEL to carry out a design. 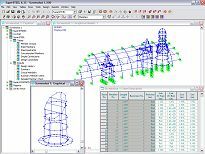 Section sizes can be optimised by weight or depth if required and your structure will be automatically re-analysed to ensure that the most efficient section is chosen. 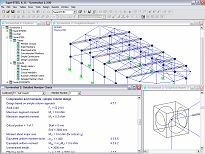 From within SuperSTEEL, you can group your members, add restraint positions, specify any concatenation and design using both simple and continuous (rigid) methods, and select whether to design to either the 1990 or 2000 code variants. All of these options are laid out in the familiar SuperSUITE environment. To use SuperSTEEL you will require detailed steel section information. We supply libraries for both the UK and overseas markets, and these form the SuperSTEEL package. Output from SuperSTEEL can be obtained at a number of different levels: Summary output for loadcase, member group and also for the critical member whereby the most critical check is displayed for the worst member in the group. Alternatively a detailed report can be selected providing a design calculation sheet for presentation purposes. A 'usage factor' for each member can also be displayed to gain a greater understanding of any member that may be inappropriately grouped. Carry out design checks on all or part of the steel structure. Select the most suitable section, based on minimum weight or minimum depth criteria. Steel grades, effective lengths, restraint positions and eccentricities can all be modified to refine the design for specific requirements. Independent restraint conditions to top and/or bottom flange. Automatic iteration for quicker design. Graphical input and editing of member attributes. 1990 and 2000 design options available. Simple and continuous (rigid) design. SuperSTEEL is developed under our TickIT approved Quality Management System, which ensures well documented, well structured and reliable software.